Biometric fingerprint reader with durable and highly accurate optical sensor. Quick single touch, one second user recognition. Alarm, door, and egress button contacts. Selectable 26-bit or 34-bit Wiegand data input and output. Audio-visual indicators for acceptance and rejection of valid/invalid fingerprints. Stores up to 600 fingerprint templates and 15,000 transactions. Built-in serial, USB, and Ethernet ports for RS232/RS485, USB Host, and TCP/IP communication. Import and export all user data, and set up sensor settings and delay. Keeps logs of all user entries. Configure employee schedules and monitor and download access logs. Compatible EM cards (E-RFID-CRD10) and keyfobs (E-RFID-KYFB10) are available in packs of ten. Current consumption: 200mA @ 12VDC. Operating temperature: 14 to 140°F (-10 to 60°C). Operating humidity: 10 to 90% non-condensing RH. Dimensions (WxDxH): 2.87x1.38x5.83 in (73x35x148 mm). Regulatory approvals: CE, FCC, RoHS. Outputs controlled by fingerprint reader, user codes and/or EM cards. Stores up to 500 fingerprint templates, 500 cards and 8 passwords. Mode 2: RF (Only RF Card verification). Mode 3: FP (Only fingerprint verification). Mode 4: FP/PW/RF (fingerprint or password or RF verification). Mode 5: RF and PW (RF and password verification). Mode 6: FP and PW (fingerprint and password verification). 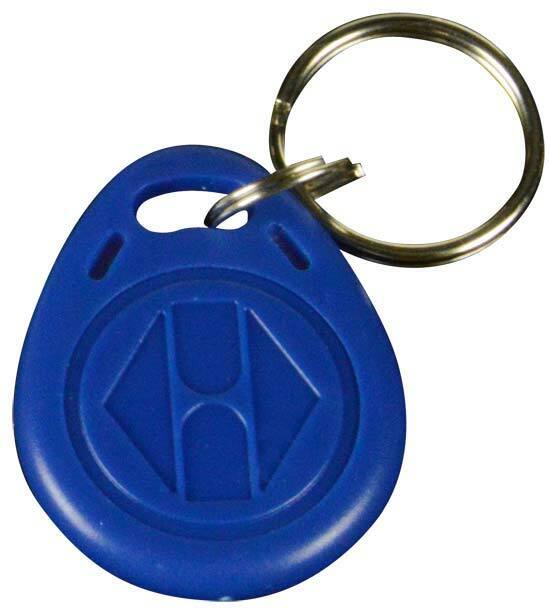 Compatible with all standard 125 Khz proximity EM cards and keyfobs. 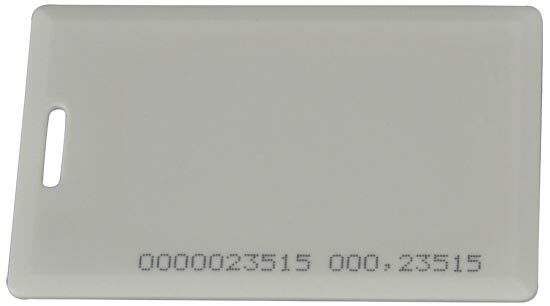 (E-RFID-KYFB10) are available in packs of ten. Current consumption: 110mA @ 12VDC. Dimensions (WxDxH): 3.5x1.3x3.5 in (88x33.6x88 mm). Two relay outputs controlled by two groups of independent user codes. Output 2: 1 Amp relay for other control applications. Normally closed and normally open dry contacts for both output relays. Operate with fail-safe or fail-secure locking device. Open collector outputs for Duress, Key Active and Inter-lock functions. LED indicators for operation status and system status. Non-volatile memory in case of power failure. Door automatically re-locks after valid access to prevent "tailgate entry". Output 1: 100 user codes. Output 2: 10 user codes. Dimensions (WxDxH) in: 2.83x1.69x4.57 (72x43x116 mm). Output 2 & 3: 1 Amp relay each for other control applications. Output 1: 5 Amp relay for door strike. Output 2 & 3: 24VDC/100mA sink open collector output for other control applications. Normally closed and normally open dry contacts for most relay outputs. Extremely long programmable timers for output relays. Open collector outputs for Duress, Alarm/Key Active and Inter-lock functions. 34 bit Wiegand data output on user code entry. LED indicators for operation and system statuses. Door Bell relay output (normally open). 50 visitor codes programmable for one time use or a duration of time. Output 1: 1,000 user codes and 50 duress codes. Output 2 & 3: 100 user codes and 10 duress codes each. Die-casting metal back-lit keyboard with dual brightness levels. Environment and vandal resistant (IP-66). Outputs controlled by user codes and/or EM cards. Output 3: 24VDC/100 mA sink open collector output for other control applications. Normally closed and normally open dry contacts for all output relays. 24 bit standard Wiegand data on reading of EM cards/keyfobs. One Door Bell relay contact (normally open). Output 2: 100 user codes and 10 duress codes. Includes two EM cards and is compatible with all standard 125 Khz proximity EM cards and keyfobs. Additional EM cards (E-RFID-CRD10) and keyfobs (E-RFID-KYFB10) are available in packs of ten. Current consumption: 150mA @ 12VDC. 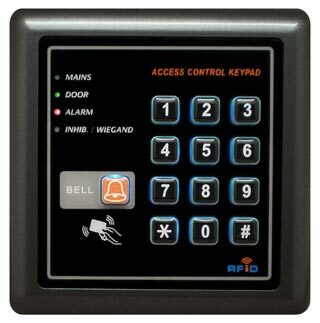 Supports additional users for RFID Access Control Keypads. E-RFID-CRD10: 2.09x0.07x3.35 (53.6x1.9x85.2 mm) each. E-RFID-KYFB10: 1.10x0.24x1.38 (28x6.2x35 mm) each. Compatible with E-FACS, E-ACKR and E-ACKR-WDB. 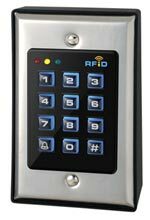 Combine with NTI's access control digital keypads or RFID access control keypads to convert a standard cylindrical lock set to an electronic access control locking system with high security and user convenience without a key. The door is locked with power ON, and unlocked with power OFF. For Fire/Emergency door or Escape door installations. The door is locked with power OFF, and unlocked with power ON. Built with universal connection terminals; can be used freely with most security systems. For security system and door strike applications.